Even with this week's tax hike for top earners here, Singapore still has the region's lowest personal income tax rates after arch-rival Hong Kong. Experts agree that even after this rise, the Republic will, for now, stay attractive to top talent and the ultra-wealthy from abroad. In its Budget 2015 on Monday, Singapore announced income tax rises for the top 5 per cent of taxpayers to help fund social spending for the poor and the elderly. The marginal personal income tax rate for those earning above $320,000 a year will rise to 22 per cent next year, from the current 20 per cent. Smaller rises apply above $160,000 a year. The changes will start with income earned next year - that is, taxes to be paid in 2017. This move will widen the gap with Hong Kong, which has a flat tax rate of 17 per cent for income above HK$120,000 (S$21,000). Hong Kong, in its 2015 Budget unveiled yesterday, said it will not raise personal income tax rates and proposed a 75 per cent tax rebate capped at HK$20,000. Opinions vary on what Singapore's hike in its top rate of tax would mean for the nation's competitiveness. Mr Leon Kwong Wing, head of KhattarWong's tax and private client division, said the corporate tax rate, which is unchanged, remains a more important consideration than personal income tax. "The income tax hike hits the highest-paid executive, but not high-net-worth individuals per se," he said. The tax hike will likely affect only a part of a company chief executive's overall income, as many get capital gains and dividends from their shareholdings, which are tax-free in Singapore, he said. "While a wealthy individual may relocate here, his sources of wealth tend to remain offshore. As an individual, he is fully exempt from tax on any offshore gains or profits, even if he brings the money to Singapore. There is also no gift tax and no inheritance tax," Mr Leon noted. The wealthy who relocate here often pay taxes only on consumption, such as goods and services tax, property tax on luxury residences and duties on alcohol, tobacco and motor vehicles. Their wealth and income are generally outside the scope of taxation in Singapore, he noted. Sakae Holdings chairman Douglas Foo, whose personal annual income is above $500,000, said the tax hike is "still manageable". "We are still competitive because there is no change to corporate taxes. As far as the income tax hike is concerned, we should take it in a positive light and accept it, because we have a very comfortable living environment," he said. "Our (income) tax rate is not as high as other countries, like Japan, which is about 40 per cent. "But we have to calibrate our tax rate carefully against other economies in the region, so as not to become less attractive to top talent and investors." Mr Jay Krause, head of international law firm Withers in Singapore, said the Republic offers "important strategic and geographic business advantages that many of its rivals cannot". Apart from taxes, factors including the efficiency of a country's government system, infrastructure, the education system, housing, environmental risks and security also play a role in relocation decisions. Mr Gerard Ee, chairman of the Singapore Institute of Accredited Tax Professionals, called the tax hike a surprise for some. 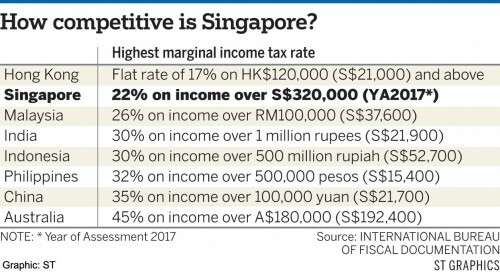 "While Singapore's top marginal income tax rate for individuals remains relatively low at 22 per cent, it remains to be seen if this change will affect its competitiveness in attracting top talent," he said. One key question is whether the tax hike will be followed by increasingly higher taxes over time. Mr BJ Ooi, partner and head of global mobility services at KPMG Singapore, said: "If this trend continues, there may come a point when our competitiveness in attracting the right talent will be severely dented."